Galvanized temporary pool fence is installed around a swimming pool with orange plastic moulded feet supported. ?Good strength and high stability. The material of the fence is high quality low carbon steel, so the fence has a good strength and high stability. ?Corrosion resistance. The surface of the portable pool fencing will be fully galvanized after welding. ?Quick and easy to install and dismantle. ?Hinged gate attached to the temporary pool fencing will increase the safe level. ?It is difficult for children to climb. ?Low cost and installation investment. ?With a artistic appearance can decorate your environment. ?Panel size (L × H): 1980 mm × 1250 mm, 2000 mm × 1100 mm, 2000 mm × 1250 mm, 2100 mm × 1100 mm, 2400 mm × 1290 mm. ?Frame: ?Outside diameter: 20 mm, 25 mm, 32 mm, 40 mm, 42 mm, 48 mm. ?Thickness: 1.5 mm, 1.8 mm, 2 mm, 2.5 mm. ?Infill pipe: ?Outside diameter: 14 mm, 16 mm, 20 mm, 25 mm. ?Pipe spacing: 60 mm, 70 mm, 100 mm, 190 mm, 200 mm. ?Feet: flat metal feet, plastic moulded feet. ?Distance between the bottom of the panels and the ground: 100 mm. A galvanized temporary fence is installed at a pool. The temporary fence is supported by the orange plastic moulded feet. ?Gate size (H × W): 2000 mm × 1050 mm, 2100 mm × 995 mm. ?Frame: ?OD: 20 mm, 25 mm, 32 mm, 40 mm, 42 mm, 48 mm. ?Infill pipe: ?OD: 14 mm, 16 mm, 20 mm, 25 mm. 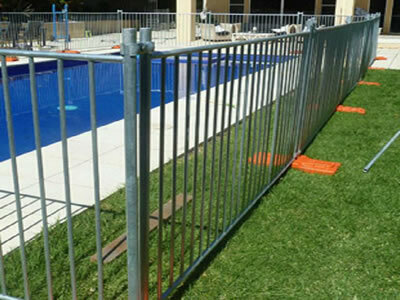 A temporary pool fence gate is installed with temporary fence around a no water swimming pool. A galvanized temporary pool fencing with flat metal feet is installed at public swimming pool. A temporary pool fence gate is installed with temporary fence around a swimming pool. Temporary pool fencing and gate installed around a outdoor swimming pool. Car boot sale ad details Temporary Pool Fencing as Barriers for Spa and Pool for sale in Wigan. Temporary Pool Fencing as Barriers for Spa and Pool available on car boot sale in Wigan. More Power saws for sale in Wigan and more second hand sale ads for free on 2lazy2boot - Wigan car boot fairs - 42209.